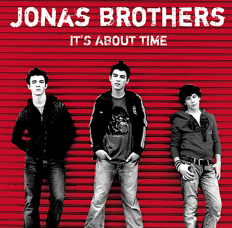 It's About Time is the debut studio album from the Jonas Brothers. It was released in August 8, 2006 from their then-label Daylight/Columbia Records. The album managed to peak at #91 on the Billboard 200 and, to date, has sold over 50,000+ copies in the United States. The brothers decided to switch record companies from Columbia Records to Hollywood Records, and Columbia was told not to sell any more copies of "It's About Time". Since the band had become a favorite to Disney viewers/listeners, they signed with Hollywood Records in early 2007, where their second release (and their first release with the record company) has sold more than 1.5 million copies. That time, it was announced that this might be the band's one and only album under Columbia. It's About Time was taken off of the iTunes store although the music video for "Year 3000" is still available for purchase. Since this album is out of print, it is being sold on auction sites like eBay for up to $200. The song "Time for Me to Fly" was featured on the original soundtrack of the movie Aquamarine and the ConGRADulations Class of 2006 Compilation CD, but the track was taken off from Aquamarine's soundtrack on the iTunes store. The limited first edition of It's About Time was released in some Christian stores on May 2, 2006, from INO Records. It is now certified as a collector's item, as well as the second release, which debuted on August 8, 2006. Below shows the official Track Listing of the 1st Prelease Edition. Most of them have the same tracks as the 2nd release but there are three added tracks. And there are three more different tracks not in the 1st release. Singles "Mandy" and "Year 3000"